Which States Are Most Interested In Golf? To find the answer, I used one of Google’s search data tools to determine which states search most often for golf related terms. Fortunately, Google makes this particular data set pretty easy to generate and even produced a nice color coded map. Thanks, Google. The results are based on the last five years worth of search data. The top twenty states most interested in golf are listed below. The numbers indicate relative interest. South Carolina generates the most golf searches, so it scores 100. Florida, at number two, generates 86% of South Carolina’s searches. Hawaii generates 85% of South Carolina’s, and so forth. The top of the list of states most interested in golf features American golf’s traditional strongholds: South Carolina, Florida, Hawaii and Arizona. With perpetually hospitable weather, residents and visitors in those states should easily outpace northern states where residents are more likely to Google the snow report half of every year. Still, northern states make a respectable showing. Minnesota, Nebraska, Iowa, Wisconsin, Ohio and Michigan all have short golf seasons, but make their appearance in the top twenty. Michigan, with its 850 courses and golf-mad population doesn’t surprise me. Michiganders get a year’s worth of golf in between April and October. And truth be told, as I write this in January, many of us still are playing. I suspect the same is true in the others. I would, however, be interested in knowing more about the “golf cultures” of those states. Interestingly, California, which also has a huge number of courses and year-round golf weather, doesn’t crack the top half of the list. Perhaps Californians as a whole are not particularly interested in golf. 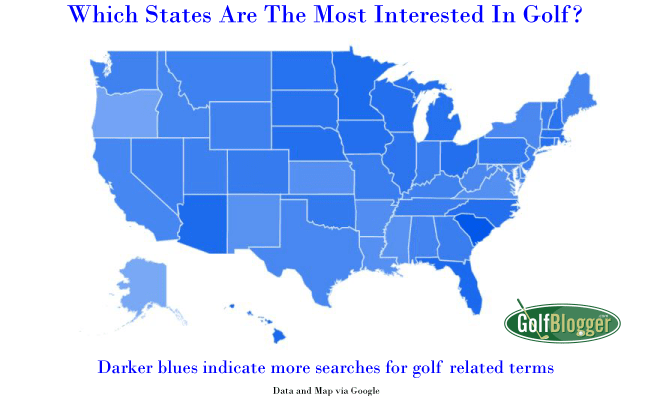 An interactive version of the map below shows which states are most interested in golf. As with the list above, the numbers are an indicator relative to South Carolina’s most googling status.